Question: I am having difficulty opening an old .xls file using Excel 2010. I keep getting “file is corrupt and cannot be opened” error. How do I fix this? From the Ribbon, click on File > Options. Excel Options dialog box will open. Click on Trust Center from the left pane of the dialog box. Click on the Trust Center Settings button. Click on Protected View from the left pane of the dialog box. Under Protected View options on the right pane, uncheck all the boxes. Click OK until you exit the dialog box. Close Excel and open the file again. At this point, the file you are trying to open should open without any error. 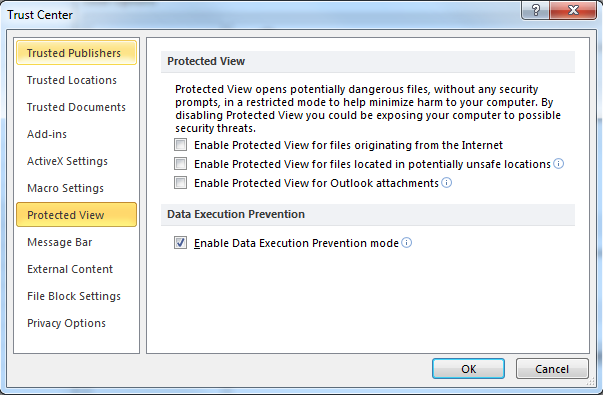 The protected view in Excel prevents potentially dangerous files to be edited and thus opens them in a restricted mode to help minimize harm to your computer. Since you may have been working with an older Excel file, the protected view settings was preventing the file from being opened.